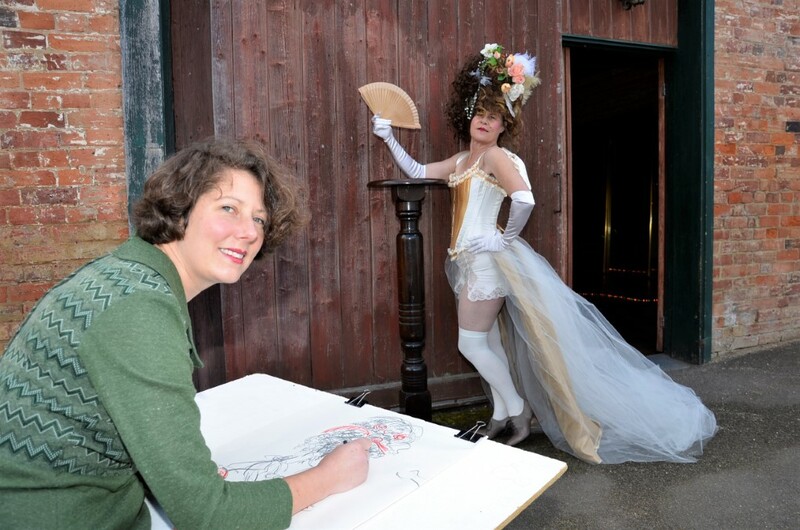 Guildford artist Bridget Farmer sketches Rococopops who is among the regular characters known to pose for the popular Dames, Drinks and Drawing sessions at Guildford. It’s amazing what goes on in little country halls. Just ask the folk out Guildford way where the local music hall has turned its hand to hosting regular life-drawing classes – with a twist. While most would associate life drawing with efforts to capture the human form in the raw – sans threads – the Dames, Drinks and Drawing sessions that have been not-so-quietly taking place each month for the past five, come complete with costume of the burlesque sort. The unique sessions are the brainchild of enthusiastic member of burlesque group, Bliss Bombs Burlesque, local artist Bridget Farmer. “I’d been wanting to do this for years just because I love costume,” Bridget says. Bridget and several fellow Bliss Bombs members have been front and centre donning various burlesque-inspired costumes – and the characters that inhabit them – to pose for the sessions that have proven so popular they’ve been booking out. “We’ve sold out each time,” Bridget says. Bliss Bombs member and experienced life model Angela Down says special guests have also been known to pose for the sessions, including at least one actor who was quite happy to dress in drag to please the punters. “We book it to 25 people although we may be able to squeeze in some extras – maybe,” says Angela who has been life-modelling since the age of about 17. “We set up poses of different lengths and the longest is usually 20 minutes. “The people who love it can’t be stopped and the focus in the room is phenomenal. With life-drawing devotees travelling from well outside the area for the sessions, bookings are essential and available at www.damesdrinksanddrawing.eventbrite.com.au. The sessions take place on the last Wednesday of the month from 7-9.30pm. 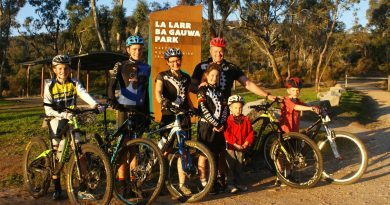 Preparing to compete: Harcourt's Brasher family features five keen mountain biking members who are looking forward to this weekend's competition Pictured (left to right) are Owen Brasher,13, Al Brasher, 15, Andrea Brasher, Sammy Brasher, 10, Brian Brasher, Paddy Brasher, 4, and Declan Brasher, 7. 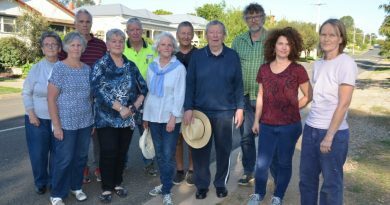 A large number of Wesley Hill residents, including the small number pictured, are opposed to the tower plans. 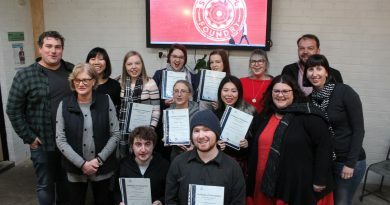 Representatives from the Social Foundry and the Kyneton Community and Learning Centre celebrate with their first round of graduates from the 'Skills for Life' program.